The primary fluid flow relationships are the Bernoulli (mechanical energy) equation, energy and continuity equations, along with an equation of state. In particular, the Bernoulli equation is important in describing how mechanical energy is transformed into thermal energy. Analytical solutions of the Bernoulli equation pose calculation complexity since the density may change considerably with pressure. Solving the Bernoulli equation analytically for compressible fluids requires a set of simplifying assumptions that limit the application. The most challenging is the assumption of an ideal gas, where gases approach ideal at zero pressure and high temperatures. Other assumptions are constant heat capacity and the characterization of density changes with pressure. Further, analytical solutions do not lend themselves conveniently to multiphase flow. Despite these limitations, analytical equations are the norm and are sometimes used inappropriately. For example the incompressible equation is used for flashing fluids above the cricondenbar (the pressure peak of a phase envelope typically called the dense-phase region), although these fluids exhibit variable densities. Additionally, the compressible gas equation is used for high-pressure gases which do not exhibit ideal gas behavior. It is becoming more prevalent to use integral methods to numerically solve the Bernoulli equation, so that analytical equations are not necessary. Integral methods are of course not new; the power industry has used them for years for single and two-phase flow of steam and water. With increasing computational power, excellent thermodynamic and physical property databases, and the use of compositional models where process streams are characterized by their individual components and not just bulk properties, integral methods provide elegant solutions. 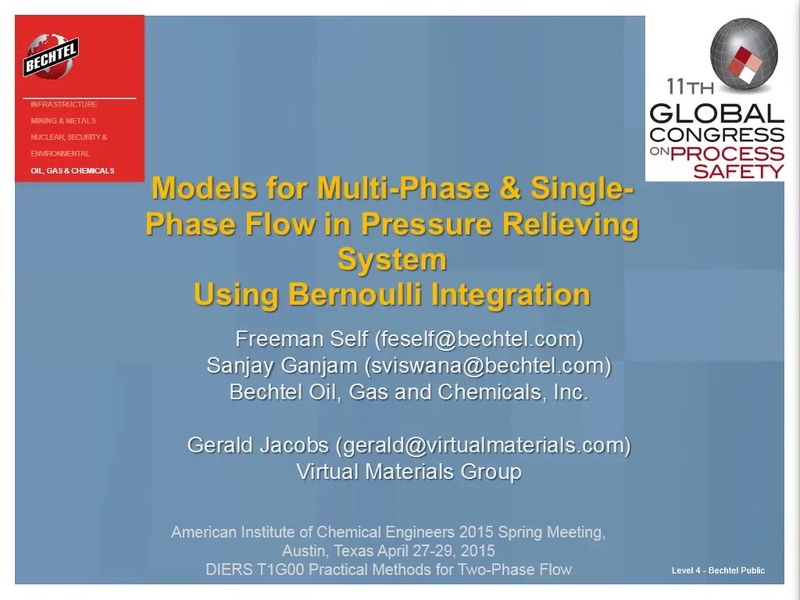 Further integral methods easily lend themselves to use in multi-phases models. This paper will illustrate how to set up models for several common situations like pressure relief valves, orifices, control valves, and pipe tees. Examples and derivations will be provided to illustrate how these models can be used for choked / non-choked, single and multi-phase systems. The integral method has proven successful for relief valves under a full range of fluids and conditions, including flashing liquids, high-pressure gases, dense-phase fluids and multi-phase fluids for both choking and non-choking conditions. Additionally the equation may be arranged to account for fluid slip between gas and liquid phases (i.e. the velocity of the phases are not equal) and phase non-equilibrium if appropriate data is available. The mass flow relation will be written in terms of mass flux G [mass/time-area] and area A. To account for errors due to assumptions, a discharge coefficient is introduced. The area and discharge coefficient are often included in the same parameter grouping. In British Standard Units, the equation presents the mass flux G in units of lb/hr-in2, area in inch2 and pressure in psi. The mass flux at the vena contracta is evaluated from the integral as a constant entropy process starting at the relief pressure. The mass flow is then determined from the area at the vena contracta and mass flux. Since the flow from the inlet to the vena contracta is essentially frictionless, and heat transfer is minimal, the flow may be considered constant entropy process. The integral method is especially beneficial since it rigorously evaluates the mass flux for variable densities. If the fluid chokes at the vena contracta, the choke pressure and conditions are determined. For multi-phase flow, the mixed-phase density at the vena contracta is expressed as a homogenous average density, which a reasonable assumption for highly turbulent relief flow. The discharge coefficients for industrial relief valves may be obtained either from the National Board Pressure Relief Device Certifications NB-18 (“Redbook”), or API Standard 526 “Flanged Steel Pressure Relief Valves”. · For gases, Kd is 0.975 for many major vendors based on API Standard 526. This implies that the equation properly predicts actual flow data. · For liquids, Kd varies between vendors but is on the order of 0.75. As opposed to gases, this implies that the liquid equation requires adjustments to match flow data. · If the flow does not choke, both the inlet nozzle and body downstream of the vena contracta is involved and the “liquid” discharge coefficient is used. A critical flow orifice is an orifice which chokes in compressible flow. Generally for the orifice to choke, the orifice is required to have a certain thickness relative to the orifice hole. Thick orifices, manufactured with square edges, with thickness / diameters greater than 1.0 will choke in compressible flow. The same formulation and assumptions used for relief valves may be used for orifices with similar results. The schematic illustrates the flow streamlines. The coefficient of discharge is labelled Cd. For choking flow of compressible gases the Cd has been experimentally determined as approximately 0.84; values are found in handbooks. Flashing liquids and choking multi-phase flow may also be modeled by a thick-orifice using the homogenous assumption and the mixed density. Control valve design exhibits several unusual features. First, the coefficients of discharge for gases and vapors are not dimensionless but have units of measure, and the value is dependent on the units. For example, the liquid discharge coefficient Cv has British Standard units in gallons / minutes -psi1/2. Control valve equations are generally treated as orifice equations. The pressure drop that produces flow is that between upstream and the vena contracta, and this is the pressure drop used in numerical integration. However, unlike orifices, control valve sizing is based on pressures upstream and downstream of the valve, which requires accounting for pressure recovery in the valve outlet body. Additionally some control valves are characterized by higher discharge friction with low pressure recovery. The challenge is to develop the control valve model with parameters utilized by the control valve industry. Although some models include specific terms for friction, this paper will represent the flow similar to orifices, and the mass flow relation will be written in terms of mass flux G and area-discharge coefficient parameter. The mass flux G is in units of lb/hr-in2, area is in inch2 and pressure in psi. The mixed density is where X is the vapor mass fraction. XT is the choking pressure ratio. Fg is used to adjust heat capacity ratio from air and Cg is a consolidation of terms that are functions only of the ideal heat capacity ratio. The area-discharge coefficient parameter group will be found by equating the ISA control valve equations to traditional orifice equations. These will be used to define the mass flow. · The group for incompressible fluids is [ A K ] = ( Cv / 38), which is a well know relation.